To run the Priceonomics blog, we developed a dashboard called Content Tracker. Tracker is a dashboard that measures the performance of our content; after we publish a new article, what happens? Tracker shows us the traffic, social sharing, and inbound links generated by the article. It also notifies us in Slack or by email when something cool happens, like another media outlet mentioning our article. We also use Tracker to A/B test our headlines so you are enticed to hopefully read our articles. 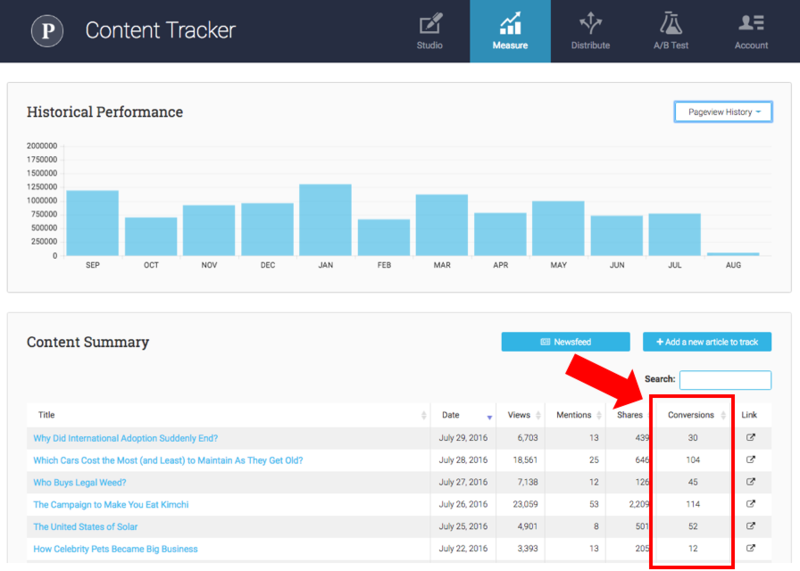 3,000+ companies now use Tracker to make sure they make their best content. Customers of our content marketing agency (the Priceonomics Data Studio) use it to measure the effectiveness of the content we make for them. If your company has a blog and does content marketing, you should use it too. Today, we’re announcing a new feature in Tracker: conversion tracking! When you publish a blog post, does that post result in customer conversions? Put differently, did that piece of content marketing directly lead to the outcome you wanted (customers buying a product from you or taking some action)? People do content marketing for many reasons (inbound link generation and brand building are some common reasons), but everyone is interested in customer conversions. Now, when you log in to Tracker, there is a new column in the dashboard called Conversions. For every blog post, you can see the number of conversions attributable to a blog post. Since we don’t have any banner ads on Priceonomics, conversions matter to us. Our business is built around the concept of “make great content, finance it by selling products.” So, while we don’t really care about an incremental pageview, an incremental customer is really great. The primary way we make money at Priceonomics is through our Data Studio, our agency that helps companies turn their data into content marketing. When we publish data-driven content, it invariably leads to enquiries from companies that want that same thing. We also make money from companies subscribing to use Content Tracker for their content marketing. So, when we publish a blog post, we’re interested in the number of conversions: the number of potential customers who click to learn more about our Data Studio or Content Tracker software. The third metric we track is the number of email subscriptions generated by each blog post, since our newsletter is the primary way we distribute our articles. The 20,000th person joined our email list last wee. You should join too! For each article, we track how it converted on each of these metrics. We’d really like you to become a Data Studio customer, but using our software for your content marketing, or just signing up for our newsletter, is good too! Have we noticed anything since adding conversions from Tracker? A few things so far. Data-driven posts generate the most leads for our Data Studio. Longform content grows our email list most effectively. 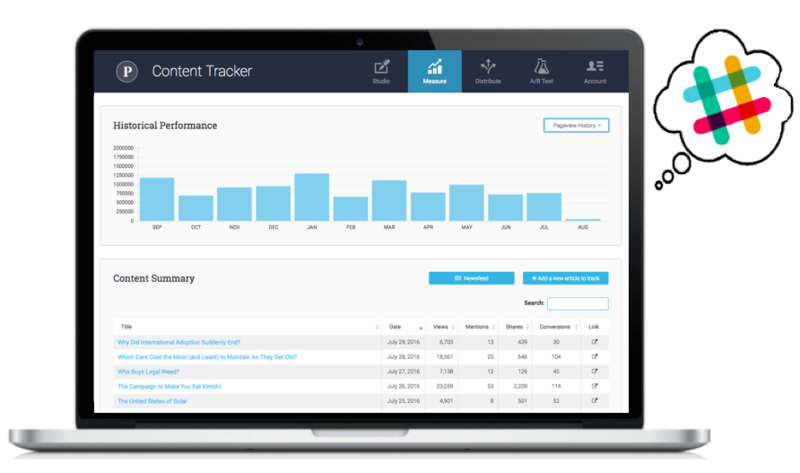 A small percentage of readers, regardless of what kind of article or blog post they read, check out Content Tracker. If you use Goals in Google Analytics, Content Tracker will work straight out of the box for you. 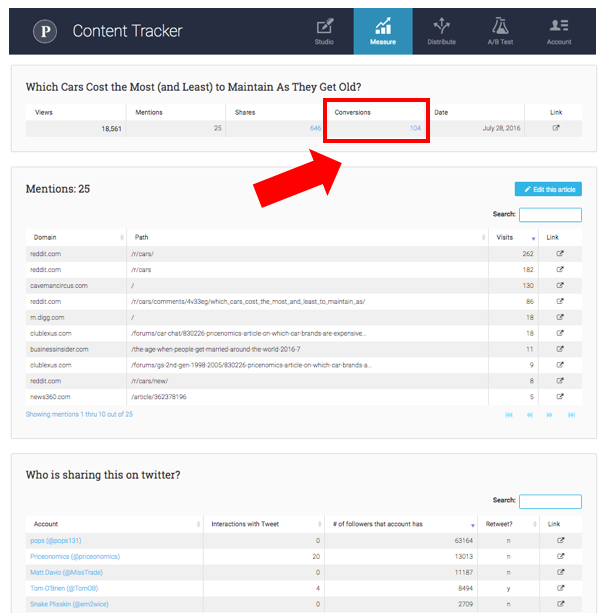 Tracker is looking to see if a customer came in through a particular blog post and eventually converted. You can define “converting” however you want (signing up, viewing a marketing page, joining a list, etc). Most of our existing Tracker users already have goals set up in Google Analytics, and now it’s very clear which content pieces result in goal conversion. If you don’t already use Goals in Google Analytics for conversion attribution, it’s pretty straightforward to set up. Once you add a Goal in Google Analytics, Tracker will automatically start monitoring it and attributing it to pieces of content. And then you’re done. If you’re the manager of a content marketing program, you have instant visibility into which articles are generating customers (in addition to inbound links and visibility). If you make content all day, you can now show your boss your results. Anyhow, if you want to make sure that your company is making content that has a positive financial return and impact, you should use Tracker. It starts at $49 / month, and it has a free 14-day trial. We think you’ll like it. Here's the link to sign up.